A fresh, bright, and contemporary workspace with flexible, comfortable seating and work surfaces so you can focus, create, and collaborate. With convenient parking, easy building access, lots of windows, and an open concept, RISE Collaborative Workspace sets itself apart from other co-working spaces. 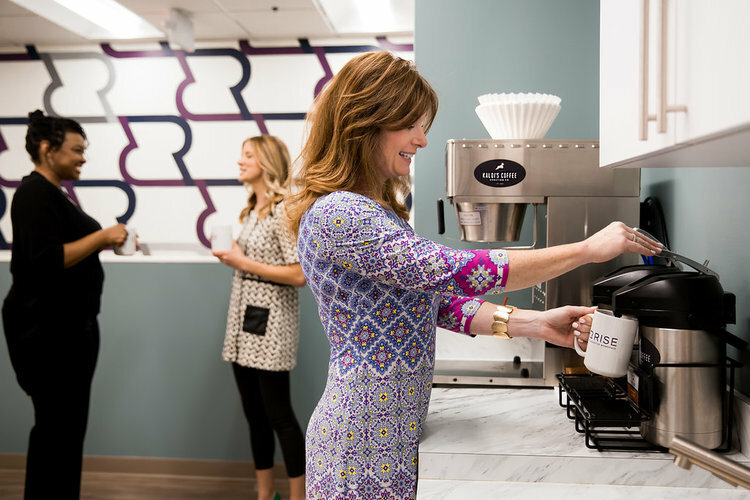 RISE Collaborative Workspace provides a professional setting and services specifically designed with the qualities and features female professionals want and need to succeed. We love to show off our space. Schedule a tour to see what makes RISE Collaborative different. Our part time members enjoy a bit of a hybrid plan. These members tend to be people who work from home or have an office elsewhere, but enjoy getting out of the house once in awhile or need a convenient, professional place to have coffee meeting. This option offers the best of both worlds. Our 11 private offices are the crown jewels of RISE Collaborative. Our Premier Office Members really shape the community and are leaders in our space. We strive for industry exclusivity for the private offices and have created quite a diverse mix in St. Louis (Accountant, Event Planner, Digital Marketing, Executive Director, Counselor, etc). Each private office is furnished with a desk, adjustable office chair, and wastebasket. Private office members may bring in additional furniture and decor. At present, the private offices are sold out in St. Louis. Email us at info@riseworkspace.com to join the waitlist.